« It had to happen -Post & Go V2 produces rare birds indeed! No more Gravure? -Post & Go Sheep sets and FDC stamps printed by Hytech. 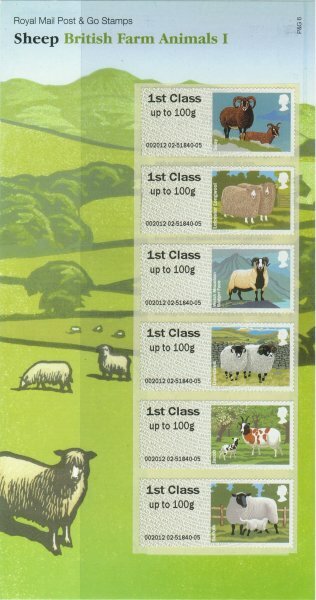 We all know that the next set of Post and Go Pictorial Stamps will be “British Farm Animals” featuring sheep from around the UK and will be the first in a series of three issues that will explore some of the many traditional breeds of sheep, cattle and pigs to be found on farms in the UK. But, as a dramatic departure from the previous ‘Birds’ sets , where these items sold directly from Talents House would have been press-printed in Gravure (and a have very buying propecia online distinct print appearance) Royal Mail have confirmed that, for this issue at least, the ‘set’ stamps and those used on Royal Mail produced FDCs will be printed by Hytech. The ‘set’ pack containing six 1st class stamps has been redesigned (rotated through 90 degrees) to take the new, but now familiar Hytech ‘strip of six’ as seen at the last two Stampex shows. And the good news is that there is no premium for this pack and so it can be pre-ordered at the face value of £2.76 (6 x 1st Class) – a sure sell-out item? This entry was posted on Tuesday, December 20th, 2011 at 3:29 pm	and is filed under Dispensed Labels (ATM). You can follow any responses to this entry through the RSS 2.0 feed. You can leave a response, or trackback from your own site.